Russian systems like ‘Pantsir-S1’, ‘Iskander-M’, ‘Kornet-EM’ and others made by High-Precision Weapons Holding (part of Rostec Corporation) are determining technological and combat future of high-precision systems all over the world. This Russian holding is the primary designer and manufacturer of Russian high precision weapons is engaged in producing the world’s best types of high precision weapons. The High-Precision Weapons Holding was founded in 2009 and includes 19 enterprises being mostly world leaders in their production and technology segments is the world largest science and technology complex engaged in developing and creating high-precision weapon systems for combat tactical zones. The company being a member of Rostec, the world largest engineering corporation, is among the leading designers of state-of-the-art weapons in the world. The holding consists of a number of largest leading defense enterprises that are well known on the world arms market. It is sufficient only to mention such brands as Shipunov KBP Instrument Design Bureau, Tula Arms Plant, Tulatochmash, Tactical Missiles Corporation, Nudelman Precision Engineering Design Bureau, Kovrov Electromechanical Plant, V.A. Degtyaryov Plant, All-Russian Scientific Research Institute Signal, and others. Most of them are national and international leaders in their segments. High-Precision Weapons Holding plays an increasingly important role on the world arms market. The holding is the Russian largest developer and manufacturer of the most modern and innovative high-precision weapons. The importance and potential of the Russian holding increase worldwide as well: On a scale of the top 100 weapons manufacturers in the world, the Stockholm International Peace Research Institute (SIPRI) rates the High-Precision Weapons Holding from Russia at 39. Such a success can be explained by increasing deliveries both to the Armed Forces of the Russian Federation and to the foreign market. According to an SIPRI expert, “the Russian companies ride the ground-swell of boosts in military spending and arms export. Eleven companies from the top 100 list are Russian ones. Their income has increased by a total of 48.4%”. It also can be noted that the High-Precision Weapons Holding belongs to the top 10 world’s defensive rankings by an overall production and supply increase rate. According to military experts among the calling cards of the company is first of all the above-mentioned ‘Pantsir-S1’ air defense gun and missile system made by Tula instrument design bureau (KBP), ship-based ‘Palma’ air defense artillery system armed with ‘Sosna-R’ missiles, ‘Kapustnik-B’ fire control system, ‘Kornet-E’, ‘Konkurs’, ‘Metis-M1’ antitank missile systems, ‘Krasnopol’, ‘Arkan’ guided missile systems and others. The majority of weapons being exported by High-Precision Weapons Holding are second to none in the world in terms of performance and efficiency. An average annual increase of the company’s export deliveries is 25-40% that is certainly a world record in the sector of high precision weapons. Middle East, North Africa, Persian Gulf countries and India are among the most stable importers of the company-made products. Recently there has been also increasing export activity in the markets of Southeast Asia, Latin America, Central and South Africa. Besides, according to military experts there is every reason to believe that by 2020 export delivery volume of High-Precision Weapons Holding may have been increased twice. It is clearly seen at nearly every international armament exhibition where the holding company takes part, its products (both at displays and open sites) are leading objects of regard for experts and ordinary visitors. This is also because everybody wants to take a closer look at famous ‘Pantsir-S1’ or ‘Kornet-E’ and meet the people who create the most efficient and advanced weapons in the world. The weight of the holding company and its products in terms of strengthening defensive power of Russian army and delivery of the newest weapons to word markets can hardly be overestimated. There is a fast growing number of high precision systems and importance of tasks performed with them in the biggest armies of the world. Thus, over the recent five years Russian Armed Forces have had increasing purchase volumes. Among absolute masterpieces acknowledged by experts is ‘Kornet-EM’ long-range antitank missile system, which in term of versatility, efficiency and reliability is considered to be a unique product of today. This multipurpose 24-hour high precision system is designed to engage ground and air targets. It is capable of killing both modern and advanced tanks including those equipped with reactive armor. As a matter of fact ‘Kornet-EM’ is a versatile defensive and offensive mean which can be also used during local conflicts with fast moving battles. In addition to engaging any tanks ‘Kornet-EM’ can easily fight any light-armored equipment, ensure crossing fortifications, provide protection against air weapons (UFV, helicopters and so on) at a distance of up to 10km. ‘Kornet-EM’ features the modern ‘fire and forget’ principle, where targets are killed almost automatically to reduce psychophysical load, skill requirements and preparation time. ‘Kornet-EM’ is also popular for its mobility and easy-to-use capability. It is manufactured in two versions, they are tripod-mounted hand-held version (to augment antitank defense of attacking and defending ground troops and field artillery) and version mounted on small vehicles (car, APC, IFV and others). It goes without saying that when you talk about Tula KBP you should anyway mention its famous ‘Pantsir-S1’ air defense gun and missile system designed to defend military, administrative and industrial assets and districts against airplanes, helicopters, cruise missiles and high precision weapons, smart air bombs and remotely-controlled vehicles as well as to augment air defense forces when repelling air strikes and kill light-armored vehicles. Today ‘Pantsir-S1’ is possibly the most famous and popular weapon not only in its class but among all other defensive means generally. It is no coincidence that currently ‘Pantsir-S1’ is among the top 10 rated ground weapons in the world. Escalation of tensions, military operations in unstable regions, all this only adds the Russian air defense system a fair-minded attractiveness to strengthen defensive power of many countries. Besides, its geographical application is extending. Military exercises and tests show that ‘Pantsir-S1’ can be properly used both in sand storm and severe conditions of polar night. In addition to that, being equipped with many heavy weapons ‘Pantsir-S1’ remains highly maneuverable, all-terrain, easy-to-use. Besides, it is capable of steady killing the wide range of targets including low-flying air ones. 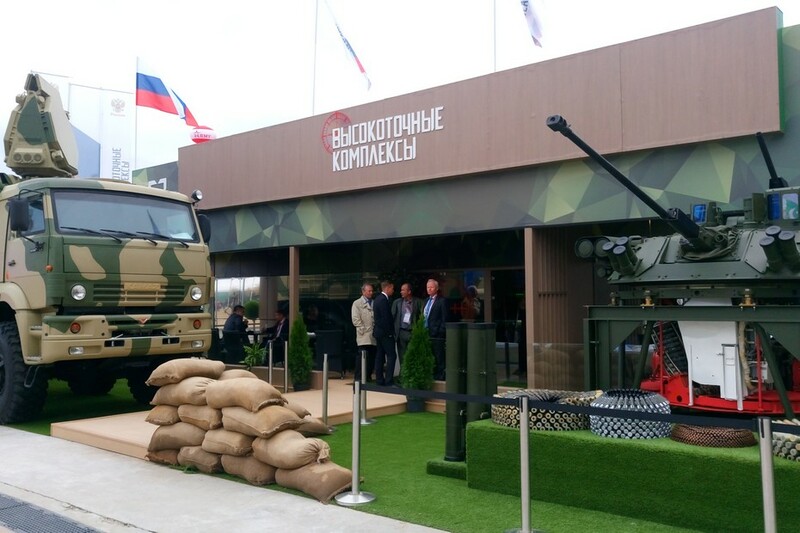 The newest defensive sensation from High-Precision Weapons Holding was the presentation of anti-aircraft artillery weapon system Pantsir-ME in Saint-Petersburg (the end of June this year). The creation of new innovative defense complex confirms the fact that Russian High Precision Weapons Holding is one of the world leaders in creating modern weapons. There was an absolute sensation in the world of military innovation. The system provides the ultimate protection against modern air threats, including small-size unmanned aerial vehicles. The naval missile and anti-aircraft artillery weapon system Pantsir-ME developed by the Tula KBP (part of the High Precision Weapons Holding) provides the ultimate protection against modern air threats, including low-flying and small-size unmanned aerial vehicles. The naval weapon systems Pantsir-ME and its forerunners Kashtan and Kashtan-M developed by the Tula KBP (part of the High Precision Systems Holding) are the only systems in the world that combine a powerful artillery armament, an effective multimode missile armament and an integrated radar-optical armament control system in a single turret mount. Equipped with two types of armament (which is already a considerable advantage), these systems have better characteristics of each individual armament type as compared to their analogues. The creation of the new weapon system ‘Pantsir-ME’ provides reliable protection for ships against air threats with absolute probability virtually equal to 1, including protection against low-altitude anti-ship missiles and unmanned aerial vehicles. The key feature of the systems created by KBP is that they can first open fire on a target with missiles and then, in the dead zone of anti-aircraft missiles, use artillery armaments, if the target is not destroyed. High engagement effectiveness is determined by the new features implemented in the ‘Pantsir-ME’ system. The modular design remains intact: 1 command module and up to 4 combat modules depending on ship type, which allows a flexible defence. The combined missile and artillery armaments ensure an effective engagement of all types of targets within the whole range of field conditions and counter-weapons with a potential for further development until 2020-2025. The combat module of ‘Pantsir-ME’ includes a multifunction radar station with a phased antenna and an intercept missile with an engagement range of 20 km, which ensures simultaneous engagement of 4 targets, as well as an engagement of new types, updated anti-ship missiles and small-size air threats and surface targets. The combat module can work autonomously and as part of a cell of 4 modules. The system can be installed on ships with a displacement of 300 tonnes and more. There is no doubt that in the framework of International military-technical forum ‘Army-2017’ the products of the High-Precision Weapons Holding and its defensive masterpieces will also be the focus of the exhibition and its guests.